WHITE CENTER, Wash. (KCPQ) -- A customer with a concealed carry permit shot and killed a masked man wielding a hatchet inside a convenience store Sunday morning, according to investigators. 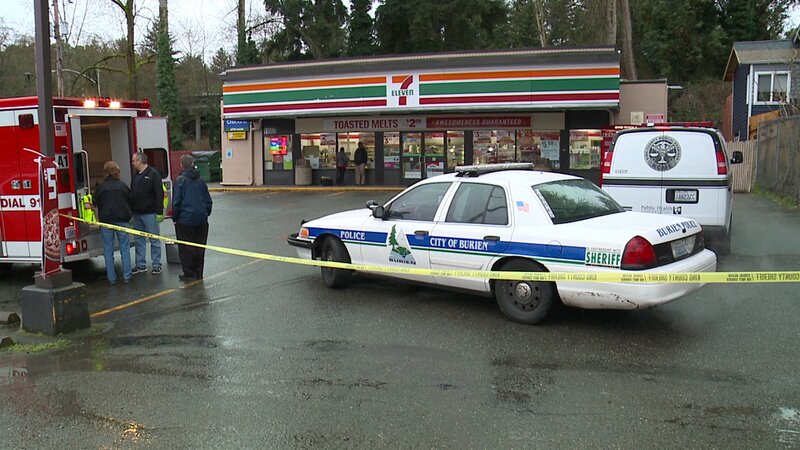 The King County Sheriff's Office was called to a 7-Eleven on 8th Avenue South, near White Center, at 5:45 a.m. The store clerk says the masked man entered the store and immediately started swinging a hatchet toward a customer -- then he turned his sights on the clerk. Witnesses told deputies the attacker remained silent during the entire ordeal. The clerk suffered minor injuries to his stomach, but before more damage could be done, the customer fired his pistol and hit the suspect. Medics arrived shortly after and he was pronounced dead at the scene. King County Sheriff's investigators say the customer who shot the man appears to have done nothing wrong, and they are happy he was there to intervene. "Fortunately, because of this customer with his weapon, this could have been a lot worse." Sergeant Cindi West, King County Sheriff's Dept. "The clerk could be the one laying there dead on the floor right now." The 7-Eleven clerk, a 58-year-old Seattle man, says the customer, a 60-year-old Seattle man, is a regular at the store and visits it daily. He was drinking his morning coffee when the attack began. "The customer's a nice guy," said another worker at the store. "He's been coming here for about 12 years. He buys scratch tickets, in the morning time. He buys coffee. He's a good guy." Investigators describe the area as a quiet neighborhood and said this was the first violent incident at the store in recent memory. The accused attacker is described only as a man in his 40s. The King County Medical Examiner will determine the official cause of death and release the man's identity at a later date.